This just in: An update in the world of bizarre, awful and ridiculous ways of treating animals. Dog spinning. 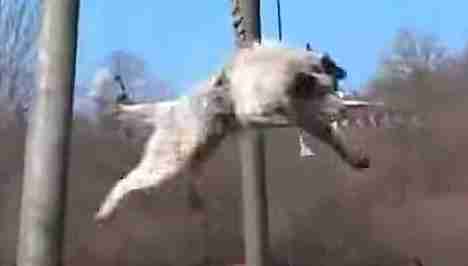 The tradition of dog spinning involves a supposedly beloved animal, hoisted between two poles and attached to a rope that is then revved to spin and spin until the dog finally falls, disoriented and terrified, into a puddle of water below. Apparently this ritual, native to Bulgaria, is a superstitious way of warding off evil spirits at the start of spring. But more recently, dog spinning has been used as a way of getting rid of diseases, like rabies and foot and mouth disease. The practice was officially banned in 2006. 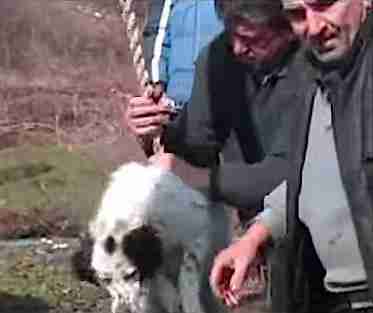 But like other bans on inhumane traditions, the law against dog spinning can be hard to enforce: Rumor has it that in some areas of Bulgaria, man's best friend is still scared sick from spinning. A video showing the practice was uploaded to YouTube as recently as 2011. And we call ourselves "rational animals." Add your name to a petition saying this is simply not OK.